In the late 19th and early 20th century, numerous people with schizophrenia recovered and lived functional lives without receiving pharmaceutical treatment (Whitaker, 2011). The spontaneous recovery has changed since advent of barbiturates and the use of antipsychotic medications. With medication, the initial schizophrenic crises can be more easily managed– patients have less disruptive symptoms although they slow down and often life in a mental fog. Now there is new doubt about the efficacy of long term use of antipsychotic medication treatment as reported by science writer Clare Wilson in her New Scientist article, “Rethinking schizophrenia: taming demons without drugs”. She point out that there have been no long term comparative outcome studies between continued drug treatment and stopping drug treatment except for observing the increase in serious side effects such as tardive dyskinesia. Psychiatrist Wunderlink and colleagues (2113) in the Netherlands have just published an outstanding controlled study. They showed that when the people were assigned to either a medication or stopped medication group, the stopped medication group did nearly twice well over the long term. In the short term, the stopped medication group had a higher relapse rate. However, at the end of seven years they showed significant lower relapse rate and double the rate of having functional lives (e.g., holding down a job and looking after themselves) than the group that continued to take medication as shown in figure 1 and 2. Figure 1. 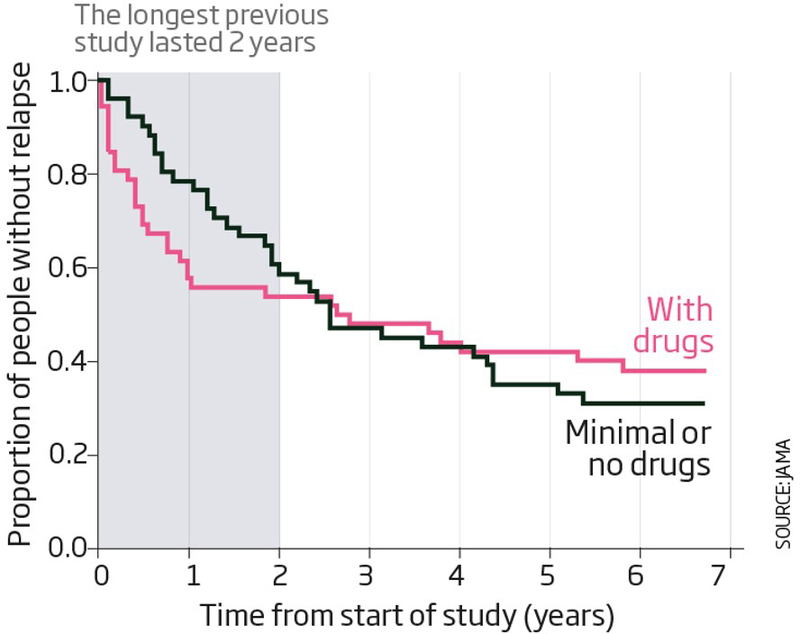 Long term study showing the benefit of minimal or no drugs after the initial schizophrenic episode as compared to continued medication. From: Wilson, C. (2014). Rethinking schizophrenia: taming demons without drugs. New Scientist, 221(2955), 32-35; based upon the published research by Wunderink, et al, 2013. Figure 2. Long term out of the ability to hold down a job or look after themselves. Those who were assigned to the minimal or no drug group had a significant improvement in functional recovery. From: Wilson, C. (2014). Rethinking schizophrenia: taming demons without drugs. New Scientist, 221(2955), 32-35; based upon the published research by Wunderink, et al, 2013. This study points out the importance of not generalizing from short term benefits which are so often augmented by active placebo factors. As the Dutch study showed, there is more harm than benefit from long term medication use in the treatment of schizophrenia. Similar results have also been reported in long term use of sleeping medication—it increases mortality risk by 25%. Long term chronic medication may cause different outcomes than for short term crises use. When medication is taken over an extended period of time, the body will adapt to achieve homeostasis. Namely, it will reduce or increase endogenous neurotransmitters or receptors to compensate for the increase presence of the drug. When the medication is withdrawn, the symptoms are now worse because the neurotransmitter or receptor have been changed and they takes time to regenerate. This process is similar to having a caffeine withdrawal headache. Drinking caffeine, induced vasoconstriction, the body compensates by reducing its own vasoconstriction. Then, when caffeine is stopped, the blood vessels dilate too much and a headache results. It usually resolves itself in a few days as the body rebalanced. The reported results that the minimal or no drug group did so much better confirms the observations that numerous people with schizophrenia in the late 19th century and early 20th century could regain functional recovery unlike what occurred after the use of antipsychotic medication treatment (for more discussion on this topic see the superb book by Robert Whitaker, Anatomy of an Epidemic. Finally, this post is a reminder to doubt the benefits of medication for ongoing long term use based upon short term studies. Kripke, D. F. (2000). Chronic hypnotic use: deadly risks, doubtful benefit: Review article. Sleep Medicine Reviews, 4(1), 5-20. Wunderink, L., Nieboer, R. M., Wiersma, D., Sytema, S., & Nienhuis, F. J. (2013). Recovery in remitted first-episode psychosis at 7 years of follow-up of an early dose reduction/discontinuation or maintenance treatment strategy: long-term follow-up of a 2-year randomized clinical trial. JAMA psychiatry, 70(9), 913-920.